As we close the door on Week 9 in the NFL, it’s time to look at Pro Football Focus’ season grades for all 32 starting quarterbacks in the NFL. The best of the best have likely already punched their tickets to the playoffs, while the signal-callers nearing the middle of the pack and below have work to do in order to get back on track under center. 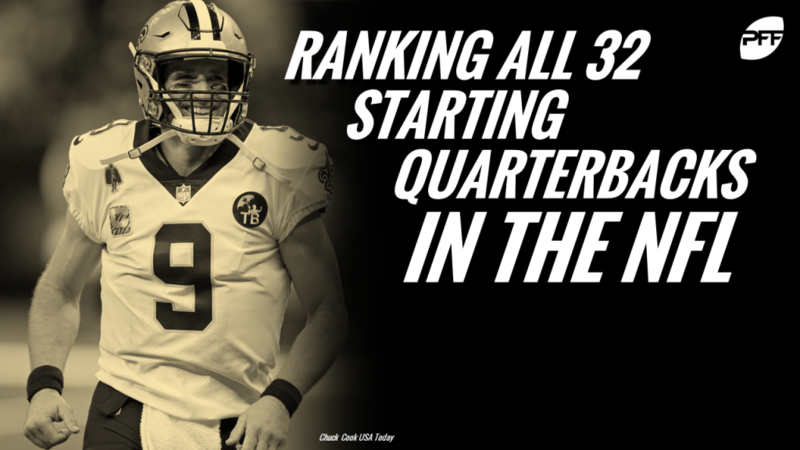 No quarterback has done it better than Brees, as he leads all quarterbacks in overall grade, accuracy percentage and clean-pocket overall grade through Week 9. He also has garnered the third-lowest turnover-worthy play percentage (1.43%) among quarterbacks with at least 100 dropbacks. Mahomes has lit the NFL on fire with his play under center for the red-hot Kansas City Chiefs. He shares the NFL lead in big-time throws (23) with a few other highly ranked guys on this list and leads all signal-callers in touchdowns of 10-plus air yards. Building on a strong sophomore campaign, Goff has taken his game to the next level in Year 2 under Sean McVay. His 94.9 overall grade from a clean pocket ranks second behind Brees, and he shares the big-time throw lead with Mahomes and Seattle’s Russell Wilson at 23. Rivers’ passer rating on throws of 10-plus air yards (139.0) ranks second among qualifying quarterbacks, his overall grade ranks fourth, and his accuracy percentage (60.9%) ranks seventh. Yet, he still isn’t getting the respect he deserves as a top-signal caller in this league and legitimate MVP candidate. Rodgers’ accuracy percentage is far from impressive this season, but he has still managed to produce the fourth-ranked grade from a clean pocket. It’s his play under pressure that’s keeping him from getting ahead of the young guns in front of him, as his passer rating under pressure (58.5) ranks 23rd on the season. There’s nothing magic about it, as Fitzpatrick has simply found ways to deliver the football accurately and efficiently all season long. He ranks ninth in accuracy percentage and third in overall grade from a clean pocket through Week 9, and, more importantly, he ranks second behind Seattle’s Wilson in big-time throw percentage at 10.33%. “Brady behind Fitzpatrick? Are you insane?” – Pats fan, probably. In the grand scheme, Brady is a much better quarterback than the magic man in Tampa Bay, but he falls just behind Fitzpatrick on this list in overall grade due to drop-offs in accuracy percentage (59.4%) and clean-pocket overall grade (91.6). But if history tells us anything, he doesn’t finish seventh on this list at year’s end. Cousins has found heaven in Minnesota in the form of Stefon Diggs and Adam Thielen, as he has more than gotten his money’s worth from his two superstar wideouts this season, specifically when targeting the duo deep down the field. Cousins, Rodgers and Mahomes each have 18 big-time throws on passes of 20-plus air yards, but Cousins leads the trio in big-time throw percentage (48.6%) and ranks second among all quarterbacks in passer rating (136.5) on such throws. Dalton is quietly having the best season of his career in Cincinnati, the leading reason why the Bengals are still in the hunt for a playoff berth. He currently ranks ninth in overall grade and clean-pocket grade among qualifiers, and he ranks 13th in passer rating on throws of 10-plus air yards (105.0). Though he ranks outside the top-10 in accuracy percentage and clean-pocket grade, Wentz has still played well enough to earn a top-10 spot in terms of overall grade. He ranks third in passer rating on throws of 10-plus air yards (139.0) and seventh in passer rating under pressure (119.4) so far this season.